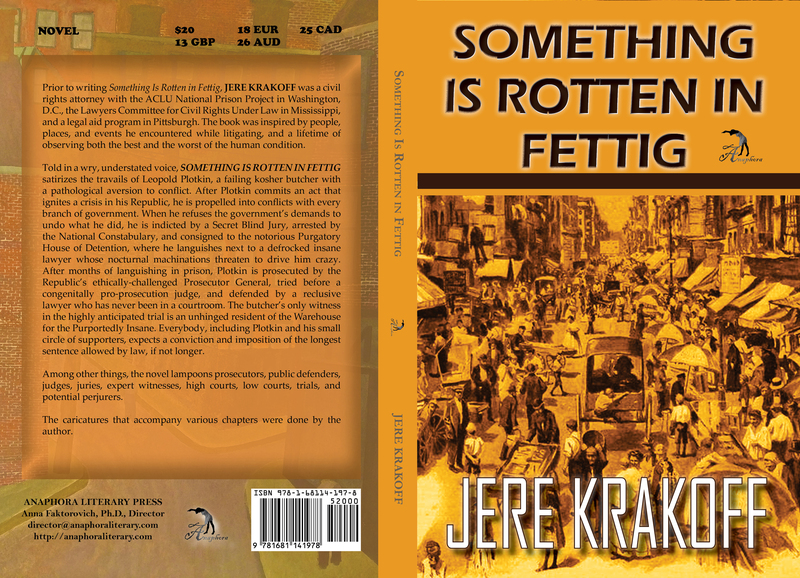 Something Is Rotten in Fettig: ($20, 268pp, 6X9″, Print ISBN: 978-1-68114-197-8, EBook ISBN: 978-1-68114-198-5; LCCN: 2015949531, February 2016; Purchase on Amazon or Barnes & Noble; $8.99 Kindle or Google Books editions): Told in a wry, understated voice, the novel satirizes the travails of Leopold Plotkin, a failing kosher butcher with a pathological aversion to conflict. After Plotkin commits an act that ignites a crisis in his Republic, he is propelled into conflicts with every branch of government. When he refuses the government’s demands to undo what he did, he is indicted by a Secret Blind Jury, arrested by the National Constabulary, and consigned to the notorious Purgatory House of Detention, where he languishes next to a defrocked insane lawyer whose nocturnal machinations threaten to drive him crazy. After months of languishing in prison, Plotkin is prosecuted by the Republic’s ethically-challenged Prosecutor General, tried before a congenitally pro-prosecution judge, and defended by a reclusive lawyer who has never been in a courtroom. The butcher’s only witness in the highly anticipated trial is an unhinged resident of the Warehouse for the Purportedly Insane. Everybody, including Plotkin and his small circle of supporters, expects a conviction and imposition of the longest sentence allowed by law, if not longer. Among other things, the novel lampoons prosecutors, public defenders, judges, juries, expert witnesses, high courts, low courts, trials, and potential perjurers. “Plotkin expects the worst, but there are surprises. Readers will enjoy this humorous trip through absurdity. The author has drawn caricatures of some of the characters to enhance the story. He also provides a list of characters at the beginning to help readers keep track of the large cast. The story is especially relevant given the current challenges to civil rights. The author’s gift for satire and his well-defined characters demonstrate ‘Tzedek, tzedek tirdof.’ This is an excellent choice for book clubs and anyone who enjoys stories in the tradition of Shalom Aleichem.” –Association of Jewish Libraries: Reviews, September/ October 2016, Volume XI, No. 3, Reviews of Literature Titles for Adults; Barbara M. Bibel, Congregation Netivot Shalom, Berkeley, CA: http://jewishlibraries.org/content.php?page=AJL_News___AJL_Reviews. Prior to writing Something Is Rotten in Fettig, Jere Krakoff was a civil rights attorney with the ACLU National Prison Project in Washington, D.C., the Lawyers Committee for Civil Rights Under Law in Mississippi, and a legal aid program in Pittsburgh. The book was inspired by people, places, and events he encountered while litigating, and a lifetime of observing both the best and the worst of the human condition.